A franchise business at a Nairobi church is improving health and providing jobs through clean water. Judith is a widow with four children. Her family spent all they had for her husband’s medical treatment before he died, and now Judith hawks bananas to purchase food for her children. The family cannot afford tap water or the charcoal needed to boil it, so Judith would wait for rain to gather water. Since industrial plants operate nearby, chemical air pollution makes the rainwater unsafe to drink. Like much of East Africa, clean water is a precious commodity in the slums of Nairobi. The city pipelines are unpredictable and often contaminated with bacteria and parasites. Boiling water can protect against some disease, but that requires burning charcoal, wood, or kerosene, leading to even more health concerns. The alternatives, mainly bottled water, are only affordable for the richest 10 percent of the population. Many non-profits confront this crisis by offering free water through digging wells. However, if the water pumps break or the wells dry up, the local community is back to where it started: still dependent on foreign help. Randy and Galen Welsch, a Coloradan father and son, founded Jibu with a different vision. 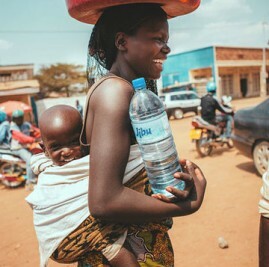 Jibu—the Swahili word for “the solution”— is a franchising business that currently provides approximately 162,000 people with clean water in Uganda and Rwanda, and that number is growing daily. When Josephine Chavaseki, Nairobi’s first Jibu franchisee, first heard Judith’s story, she bought her family their first 20-liter bottle of Jibu water. Judith had never tasted bottled water before. Her children used to suffer from typhoid, amebic dysentery and Hepatitus A, but now they have been free from illnesses for three months, and they no longer miss school. Jibu opened its first Kenyan franchise last November through the partnership of an American church, Redeemed Gospel Church in Nairobi, Transformational Ventures (T-Ventures), and Chombox. As WorldVenture’s business as mission (BAM) division, T-Ventures engages professionals, churches, and businesses to transform underserved communities. Chombox – another BAM business, repurposes shipping containers into usable space – provided their high quality water depot with a one-month turn around. When Jibu opened, many people in the community thought the water should be free, since the business partners decided to build the storefront and water processing facility on the church campus. Others thought the water would be too expensive or above their status. Josephine and Redeemed had to change the mindset of the people. Over time, the community has embraced the new business. The franchise now sells 20-liter refillable bottles of water to at least 10 customers each day. On weekends, the customers reach 50 or more. Besides the popular 20-liter bottles, Jibu also offers 5-liter, 7-liter, and cases of 500-milliliter bottles. “Many people feel their living situation has been boosted because now they are able to use bottled water, which for a long time has been perceived as water for the elite,” said Josephine. People once fearful of waterborne diseases now feel confident in their drinking water at a minimal cost. Boiling five liters of water costs roughly $1.50 in fuel. Meanwhile, Jibu customers can get the same amount of water for less than 50 cents or 20 liters for $1. A 20-liter refill can last a typical family for five days. Josephine, an active Redeemed church member who spent a year in business training, is just one example of Jibu’s African entrepreneurs who are helping their own communities with a “business-in-a-box” franchise. Each franchise purifies locally-sourced water through a four-step filtration system, distributes the water in purified bottles, and employs people from the community it serves. As a business owner, Josephine has become more aware of other needs in her community and how she can fill the gaps. She employs two staff and three interns. When the Jibu team walks in the neighborhood to promote the water, people recognize them as part of the church. Because the water is associated with the church, people trust that it is a safe, quality product. Everyone in the community is welcomed on the campus and treated kindly by the friendly Jibu team. However, not everyone can make it to the campus, so Josephine has already begun a micro-enterprise strategy that brings water to wherever people live. A few small business owners are sub-franchisee distributors, receiving water at wholesale to be sold in convenient locations throughout the community. Josephine plans to recruit a new sub-franchisee every month until the entire neighborhood is saturated with Jibu water. Redeemed has formed a strategic plan to further meet community needs. Now that the community has clean drinking water, the church’s next priority is to improve its community training center offering vocational skills classes. Jibu has proven to be the solution to much more than the water crisis for Nairobi. Health is improving, jobs are increasing, and the church is being empowered. To learn more about WorldVenture’s efforts in business as mission, explore how fashion is breaking the cycle of poverty in Kenya, how tourism is reviving an island off the coast of Mozambique, and how coffee from Costa Rica is funding ministry around the world. To learn more about opportunities to serve, check out our opportunities in business as mission as well as in Kenya, including the need for a professor of business management at Africa International University. Please consider praying for or giving to Jibu in Kenya or to other business development work in Kenya.